Okay, normally, I don't like to split up collections, but Untamed Luxury is so large, at 14 polishes, that I am breaking it up based upon Color Club's own division in the collection... the Diamond polishes and then the Indulgence polishes (which will be up soon). I was really excited about this portion of the collection because Color Club does amazing glitters, and the glitters and glitter-variants in this collection (mostly) did not disappoint. De-Luxe-Cious - Blue-grey foil with holo glitter. Reminded me of a more-pigmented and foil-y version of the Color Club Japanese glitters from last year. I think this is a very pretty, definitely unique, though you will have to use probably 2 coats of TC in order to even it out. The formula was a little thick. Pic is 3 coats, and due to the thickness of the formula, I had drag on my 2nd and 3rd coat. To combat the drag, you would just need to wait a bit longer in between coats. Ms. Hautie - Gunmetal grey satin finish polish with rainbow holo glitter and copper micro-glitter. In the bottle, the copper glitter gives it a slight duochrome effect, and this one was probably my favorite of the collection. In the bottle. On the nail, it was a bit disappointing, though I am reserving final judgement until after I put a TC on it, wear it as a full mani, and see it in sunlight. For me, with the copper glitter, this one had the same concept as Barielle Falling Star* (which is a slate blue with larger copper glitter dispersed throughout), though they are not at all similar in finish or color. This one was a bit better in formulation than De-Luxe-Cious, but there was still the risk of drag. Pic is 2 coats. Red Velvet - Jelly black base with red glitter. If Ms. Hautie was my favorite in the bottle, then Red Velvet would be my favorite on the nail. If you like the concept of China Glaze Lubu Heels or OPI Midnight in Moscow, but were disappointed in the end result, then you will LOVE Red Velvet. For me, I found the glitter in Lubu Heels to be too dark to stand out and Midnight in Moscow was too muddy. Red Velvet is neither of those things. Because of the jelly base, the red glitter was able to be suspended in the base and become more pronounced with following coats (though you won't need many). Also, unlike OPI Midnight in Moscow, this one does not look brown from a distance. It is definitely a black with red glitter. It's crazy awesome and I can't wait to wear it as a full mani. You will need a coat of TC, probably 2 coats to even out the finish, but that's pretty commonplace for glitters. Pic is 2 coats and the formula is fantastic! Untamed Luxury - Turquoise blue jelly base with blue and green glitter. 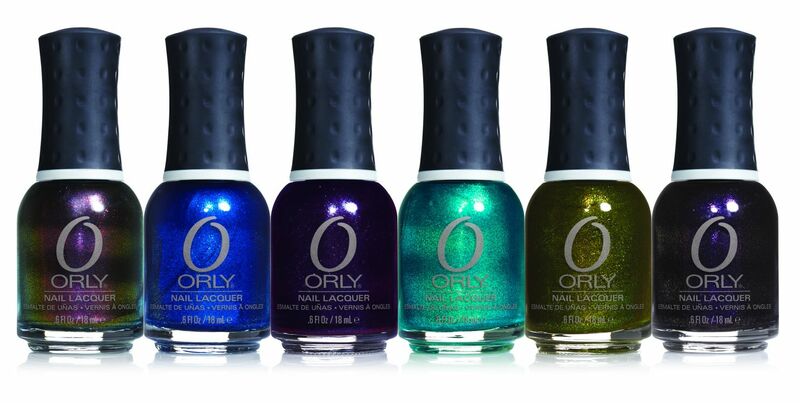 Now, I've never been there, but something tells me, if you could take the Caribbean Sea and turn it into a glittery nail polish, it would be this polish. 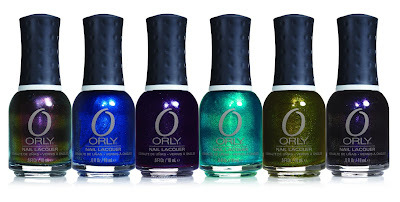 In tone, it's very similar to Zoya Charla and her dopplegangers (okay so OPI Catch Me in Your Net and Orly Halley's Comet aren't evil, but they are triplets with Charla and I just wanted to use the word doppleganger. LOL), but it's not similar in finish. 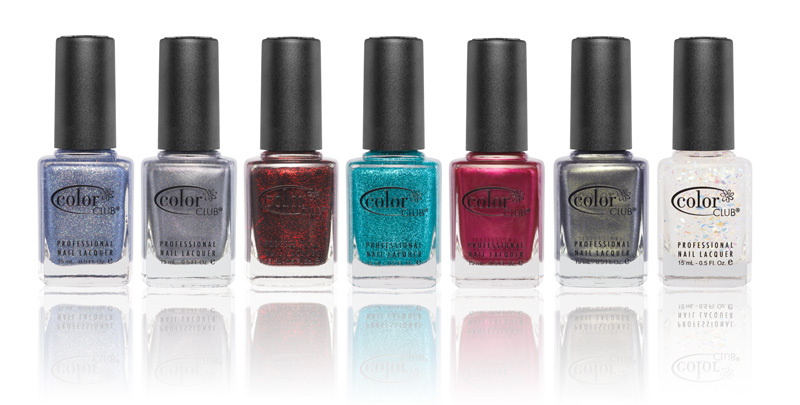 Charla, et al, are glass-flecked foils, whereas Untamed Luxury is a straight up glitter polish. They aren't dupes at all and if you love blue-greens and green-blues, you need this one. The finish on this one reminds me of the Color Club Holiday glitters from last year. Formula was great, but as it's a glitter, it has the tendency to do the free-edge-glitter-drag (as I call it), but if you go slow and take a little time between coats, you'll be fine. Pic is 3 coats. Resort to Red - Burgundy red pearl finish with red and pink micro-shimmer. What can I say? It's pretty, but it's also pretty common. The pink and red mico-shimmer make it a bit unique, but you don't notice the shimmer unless you really study this polish. 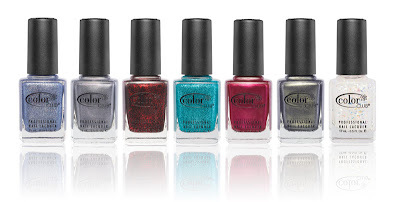 That said, I think this would be a great polish for the holidays. Because of the pearly finish, this one did have a tendency to show brushstrokes, so you'll have to watch your strokes. Formula was fine, though, and pic is 2 coats. Snakeskin - Grey-based olive satiny foil with a golden shimmer. In the bottle, this one looks like the olive/golden version of Ms. Hautie. Yet, while Ms. Hautie disappointed on the nail, Snakeskin did not. It has a similar finish to Ms. Hautie, in that it dries to a satiny finish (though not nearly as matte as Ms. Hautie). In the bottle, there was a grey/olive duochrome thing going on that didn't quite translate to the nail. It's a gorgeous color and if you love muted olive shimmers (the one coming to mind is OPI At Your Quebec and Call, though I don't have it to compare), you are going to love this one. Like Resort to Red, it was apt to show brushstrokes, but given the foil finish, the stroke marks actually looked good with Snakeskin. Formula was great. Pic is 2 coats. Covered in Diamonds - Clear top coat with large-sized, rainbow holo flakies. In other swatches of this top coat and in Color Club's own PR pics, I wasn't really drawn to this polish. For me, it looked a little odd, like someone had just crumpled up cellophane on their nails. However, in person, this is a totally different story. I can see how this color would transform any color into a completely different polish (tomorrow, I will have a pic of this over black. AMAZING). If you like flakies, and layering top coats, then you definitely have to check out Covered in Diamonds. Pic is 2 coats, and, due to the slight thickness of the formula and the big flakies, I would wait a few minutes between coats so you don't get free-edge drag. All in all, I love this portion of the Untamed Luxury collection. Resort to Red was a bit ho-hum and Ms. Hautie was a bit of a miss on the nail, but I still feel Color Club did an awesome job. Red Velvet, Untamed Luxury, and Snakeskin are worth the price of admission alone. 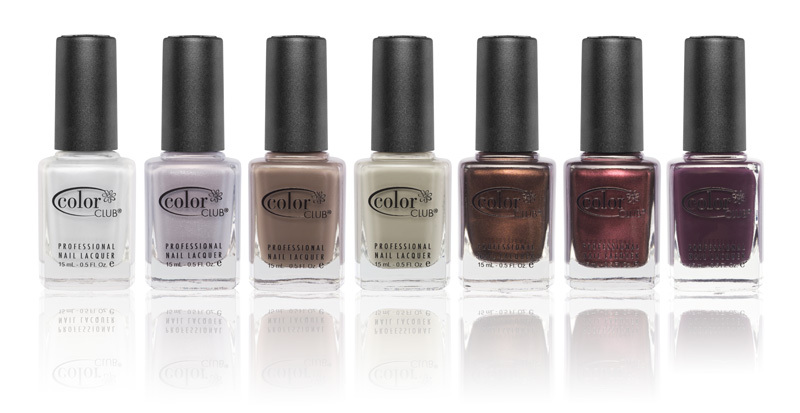 This collection is available at both TD and VNS and color club is usually in the under-$3-range. I am using both Critical Care and Nourish in this picture. Critical Care is a nail stregthener and it specifically mentions on the bottle that it's "intensive care for soft nails", and boy howdy... do I have soft nails. They have healed from the acrylics/glue-on damage, but there's still some long-term effects and weak nails is the main culprit. According to Jessica's website, Critical Care "sets a new standard for boosting growth and strength of severely weakened nails that just won’t grow. Using our exclusive Protein KSW® fortified with calcium and intense strengtheners, penetrates the nail and increases keratinization, creating a protective barrier to allow for maximum growth." I've been using Critical Care now for about 2 weeks and I've really noticed a difference in the hardness of my nails. I also feel that my nails seem to be growing faster. So, in my experience, does this product do what it says it will do? Absolutely. Now, I know in the past, I mention that I loved Dermelect and I still love Dermelect, as I feel it single-handedly helped me overcome my nail disaster last year. I also know that the Dermelect Nail System has been making the rounds on the blogs and is a blogger favorite, so it's definitely good stuff. However, I find myself reaching for Critical Care more and more. I find that my body chemistry + Dermelect + some brands of nail polish just don't play nice. I have to be very selective with what brands I use with the Dermelect products. I'm not finding that to be the case with Jessica Critical Care. One coat of Critical Care and about 3-5 minutes is all it takes for me to be ready to polish my nails. It's comparably priced with Dermelect treatments as well. Both Dermelect Launchpad and Makeover Ridgefiller are $18 and Jessica Critical Care is $17. It's not a ridgefiller, however, so if you were looking for a direct Dermelect comparison, it would be Launchpad. If you have deep ridges, you may find that you need an additional ridgefiller. You can find Jessica Critical Care on their website (click the link above as I had to do a search to find it). I was also sent Jessica Nourish Therapeutic Cuticle Formula. My cuticles and I have a complicated relationship. They flake, they get hang nails, and no matter how much I baby them, they still aren't always camera ready (a fact, I am sure, you all are well aware of. LOL). Because I'm never satisfied with my cuticles, I'm always picking up one thing or another to help with them, whether it be oil, creme, lotion, or another kind of treatment. So, I was skeptical of Nourish, to be honest. According to Jessica's website, Nourish is "an all-time classic cuticle therapy, this pure blend of antioxidant vitamins and healing agents provides instant hydration and continuous moisture to nourish and soothe cuticles and nails. It feeds the matrix of the nail as it’s massaged in to stimulate circulation and growth." I've been using it now for the same amount of time as Critical Care, 2 weeks, and I'm finding that I'm getting less flaking and hang nails. The first thing I noticed about Nourish is the scent, a soft floral. Sometimes, cuticle treatments can smell a little strong. For example, I know Mango Mend is a little too sickeningly sweet for some people. That's not the case with Nourish. Seriously... this stuff smells like it should be from Crabtree & Evelyn. It's that nice. It also has a very nice consistency. It may seem a bit greasy when you first apply it, but it's aborbed quickly in to the skin. The only downside is I think it may be a tad expensive, at $12.50, for the amount you get, but it only takes a small amount, so the tube will probably last a long time. Nourish is available at Jessica's website (click above for link). Do I recommend these products? Yes. I find them both to be great products, that, IMO, do what they say they are going to do. If you have weak, soft, and/or hard-to-grow nails, and/or problem cuticles, I encourage you to try both of these. Tonight during my training class, I decided that the new cover on my Blackberry would make a great design for a konad. So instead of during my homework, that's what I did. This was my very first Borghese. Well, I purchased Pistachio and Stellar Notte from eBay a few weeks ago, but this is my first time using either one of them. Having never used a Borghese polish before, I must say that I'm impressed. The color is a bright, emerald green shimmer, that leans ever-so-slightly blue. I bought this one because I had read that it was a little similar to the super-duper HTF Essie Dominica Green, which is a HUGE lemming of mine (so huge and so rare, I don't even bother putting it in my wish list). Now, without even owning DG, I can tell you that Pistachio is not a dupe. DG is more golden and less blue that Pistachio. That said, for a polish that is $6 and relatively easy to find, compared to one that can go for $40+ on eBay and as rare as finding a baby unicorn, I'd say this is a good compromise. No, it won't kill your lemming for DG, but it will help quiet it a bit (at least it has mine). BTW, Essie, I know you sold your soul to L'Oreal, and don't really need it, but if you could bring back Dominica Green and Starry Starry Night, you'd essentially be creating a license to print money. People would be hoarding them like canned goods before Y2K. As for formula, I'd read (after I bought it of course) that it was super thin and hard to work with. Well, the super thin part, I agree with. However, for me, it was so easy to control. Yes, it was thin, but in a good way. The pic is 4 coats. Because the polish is so thin, it was very build-up-able (:P). It dried fast, and I didn't get any drag on the later coats. I stopped at 4 coats, because I didn't know if it could have handled a 5th coat, so there a couple of thin areas on 1 or 2 nails. However, I think a 5th coat would have been no problem. I know, I know... 5 COATS!?!?! But, the 4 I applied really didn't take that long, no longer than say 2-3 coats with another brand. Because the formula applied so well and dried so fast, it really went quickly. From first coat to TC, it took maybe 15 minutes, and that's with me playing Freecell in between. LOL. Borghese is available at drugstores, at a few online stores/drugstores, and on eBay, though I think Pistachio was LE and may not be available anymore through drugstores. Before I go, I know I mentioned above that I may be short on time in the near future. Over the next few days, I will be finishing up my prep for my new job. Unfortunately, I was brought on just as they were switching over to a new system, so basically, I get no work and more training. :P Oh well, at least I can invoice for it. Not a minute to soon, either, as we just upgraded our Disneyworld resort hotel again. :S So, while I'll try to do NOTDs and a few of the reviews I have coming (I have some Piggy Polishes in the queue and some Jessicas, and possibly some OPIs and Orlys on their way), I think my China Glaze Vintage Vixen Konad Challenge* will have to go to the back burner, as well as the VV and Zoya W/W comps*. If there is anything you want to see in particular, please let me know and I will try to get to it, but since my time will be so limited, I'll have to limit the comps to requests only.